Our lunchtime read-alouds were all Christmas-themed in December and early January: The Twenty-Four Days Before Christmas by Madeleine L'Engle, A Certain Small Shepherd by Rebecca Caudill, The Best Christmas by Lee Kingman, and Amahl and the Night Visitors by Frances Frost and Roger Duvoisin. 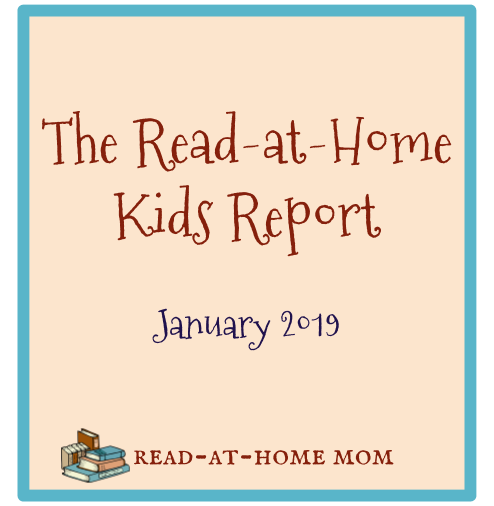 Then we read A Day on Skates by Hilda van Stockum, followed by "Snow White and the Seven Dwarves," "Rapunzel," and "Sleeping Beauty" from The Golden Treasury of Children's Literature. In the evening, my husband has been reading them The Book of Cowboys by Holling C. Holling. Between her birthday in November and Christmas, Miss Muffet amassed many new books to enjoy in the new year. These included titles in the Sophie Mouse, Chime Travelers, and Heartwood Hotel series, as well as a copy of The Sign on Rosie's Door by Maurice Sendak, Wee Hee Hee: A Collection of Pretty Funny Jokes and Pictures, and her very own paperback copy of her beloved favorite book, Mitch & Amy by Beverly Cleary. For school the past few weeks, she and I have been reading through the young reader's edition of The World We Live In, which is a vintage Life book about the formation of planet Earth. (We are also supplementing with other up-to-date texts when we run into outdated information.) As a result, she has become interested in volcanoes, earthquakes, landslides, waterfalls, and tsunamis. Much of the text goes right over her head, but she loves to listen to the big words anyway, and the book has wonderful illustrations. The other thing we've started incorporating into school is the Life of Fred math program, which uses a story to teach mathematical concepts. We've been reading a couple of chapters each Friday, and right now we're a few chapters in to the first book, Apples. She absolutely loves it so far. At a recent book sale, we also acquired a set of Golden Encyclopedias, which have become a new source of fascination for Miss Muffet. She has learned to look up topics of interest in the index, and she will also spend time just browsing each volume for something interesting to study. So far, she has learned about dinosaurs, Sir Francis Drake, stars, Teddy Roosevelt, and trilobites. On her own, Miss Muffet just finished reading Down to the Bonny Glen by Melissa Wiley and Favorite Fairy Tales Told in Spain by Virginia Haviland, and she also recently fell in love with my signed childhood copy of Sarah's Unicorn by Bruce Coville, which has infiltrated much of her imaginative play with her three-year-old sister. She is also listening to the audiobook of The Year of Billy Miller by Kevin Henkes on repeat. Bo Peep is on a quest to learn all the letters and their sounds so she can learn to read like her big sister. She is coming along quite well with this task, and seems to enjoy showing off her newfound knowledge. For Christmas, she received Rhymes for Annie Rose by Shirley Hughes, which is a new favorite, and Cook in a Book: Cookies, which has renewed her interest in the other Cook in a Book titles we have: Pizza and Pancakes. She also really likes The Girl With the Watering Can by Ewa Zadrzynska, especially after we went to see the painting in person the day after Christmas, and she is currently obsessed with Eloise Wilkin's illustrations. Bo Peep also takes a huge stack of books with her to bed at naptime each day and looks at every single one in depth. She is beginning to get into audiobooks, too, and some days, I set her up with my laptop playing Mrs. Piggle Wiggle, which is her current favorite. I am going to try to introduce some audiobooks with page-turn signals and see if she can follow along in the books. Jumping Joan has learned to say "no," so any attempt to read to her is usually met with a chorus of "no no no no no." But she loves handling books. Her current favorite is Winter Babies, which my sister sent to her for Christmas, along with Autumn Babies. She likes both, but given a choice of just one, Winter Babies wins every time. She has also become interested in Babies on the Bus by Karen Katz, Once I Was a Polliwog by Douglas Florian, and a few of our Babylit books. She is also typically present for all of our family read-alouds so she hears those books even when she won't allow us to read to her otherwise.